Minnesota DWI law is complex and can impose severe penalties for a violation. Moreover, there are jurisdictional deadlines that must be satisfied in order to preserve the right to challenge your driver’s license revocation and vehicle forfeiture. If you do not satisfy these deadlines with a properly filed petition, you will forever lose the right to assert the defenses to your driver’s license revocation and vehicle seizure, and the revocation and forfeiture will become automatic. It is therefore crucial that you retain the services of experienced Minnesota DWI attorney Jeff Dean without delay. 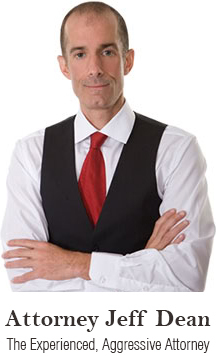 Jeff Dean has had extensive experience and great success in handling DWI cases. He has had DWI charges dismissed, won Not Guilty verdicts, and has negotiated highly favorable results for his clients in numerous cases in Hennepin, Ramsey and Dakota Counties and across Minnesota. In your case Jeff will meet with you to discuss all aspects of the charges, explain the relevant defenses, and thoroughly examine the evidence to find the best possible outcome. A DWI conviction can carry many short and long term consequences. To protect your rights and your future, call Jeff Dean today at (612) 305-4360.
the person’s body contains any amount of a controlled substance listed in Schedule I or II of the Minnesota statutes. “Physical control” is defined as an individual being “in a position” to drive or operate the vehicle. The legislature prohibits being in physical control of a vehicle while under the influence to deter intoxicated people from getting into a vehicle except as a passenger. Thus, you may be charged with DWI just for being inside of your vehicle. Factors that the courts consider in determining whether a person in physical control include where the car is parked (i.e., stuck in a ditch or in the person’s driveway), whether the keys are in the ignition, whether the car is running, and whether others are in the vehicle. In Minnesota it is a separate crime to refuse to take a blood alcohol concentration test when the police officer has probable cause to believe you are driving while under the influence. However, this statute has been called into serious question by the recent United States Supreme decision of Missouri v. McNeely, where the Supreme Court ruled that that the natural dissipation of alcohol in the bloodstream does not alone provide an exigent circumstance exception to the Fourth Amendment warrant requirement and that in DWI investigations where police officers can reasonably obtain a warrant before taking a blood sample, the Fourth Amendment mandates that they do so. Whether this decision will invalidate Minnesota’s test refusal statute is yet to be seen; for now at least test refusal is still considered a separate crime. having a child under the age of 16 in the motor vehicle at the time of the offense if the child is more than 36 months younger than the driver. The maximum criminal penalty for a 4th degree DWI is 90 days in jail and a $1000 fine. Third degree DWI is a gross misdemeanor and will be charged if there is one aggravating factor present. A person who refuses the chemical test will be charged with third degree DWI. The maximum criminal penalty for a 3rd degree DWI is one year in jail and a $3000 fine. Second degree DWI is a gross misdemeanor and will be charged if there are two aggravating factors present. A person who refuses the chemical test and has one aggravating factor present will be charged with second degree DWI. The maximum criminal penalty for a 2nd degree DWI is one year in jail and a $3000 fine. First degree DWI is a felony and will be charged if there are three or more DWI convictions or alcohol related driver’s license revocations within the previous 10 years, or if the person has a previous felony DWI, criminal vehicular operation (CVO), or criminal vehicular homicide (CVH) conviction. The maximum criminal penalty for a 1st degree DWI is seven years in jail and a $14,000 fine. If you have failed or refused a blood alcohol content test, your driver’s license can be revoked or cancelled immediately. In order to preserve your right to challenge the driver’s license revocation a Petition for Judicial Review must be filed within 30 days of the Notice of Revocation. If this is not done, you will lose your right to a hearing and the driver’s license revocation will become automatic. It is thus vital that you hire experienced Minneapolis DWI attorney Jeff Dean as quickly as possible. 1-year revocation if you had a child under the age of 16 in the vehicle. 2 years if your prior DWI was less than 10 years ago and your blood alcohol concentration was above .16. 6-year cancellation for a fifth or more impaired driving incident on record.